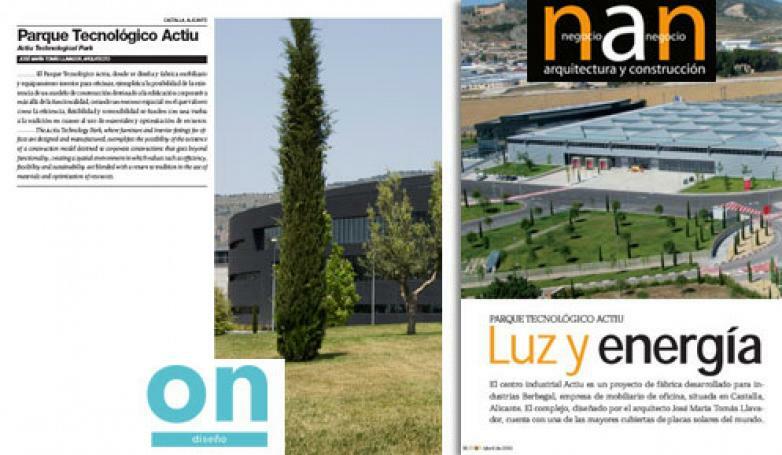 Two of the most popular professional publications about Agriculture, Design and Construction in Europe, ON DISENO and NAN, have chosen Actiu Technological Park Project as the main article in the April publication. This shows the interest awaken by the Park as a research, management and sustainable production center. ON DISEÑO, the magazine specialized in architectural spaces focused into the values of the most emblematic building in the Technological Park; corporative building. They stressed the flexibility, the space management capacity and efficiency. They accuracy communicate the philosophy of "Flexible & Open Office" which is the most representative idea since it was planned. On the other hand, NAN which is related to the Architecture and Construction, showed the industrial complex from a global point of view such as significant construction details or the different solutions provided by José María Tomás Llavador Architectural study. On Diseño article: Actiu Technological Park click here. Nan article: Energy and light click here.